SQL Server 2017: How does Batch Mode Memory Grant Feedback Work? So how does Batch Mode Memory Grant Feedback work? What's Memory Grant Feedback All About? Batch Mode Memory Grant Feedback attempts to right-size memory grants for queries, correcting for both over- and under-estimates. 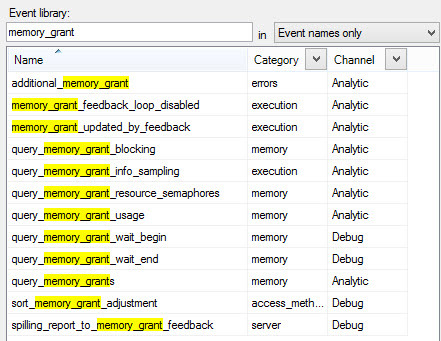 When a query runs that requires a memory grant, the optimizer will ask for a grant of a size that it thinks will keep all row operations in memory. When too much memory is asked for and granted, concurrency may suffer as a result. Memory is a finite resource, and not everything can use all of it all the time. There's no such thing as unlimited access to such resources. When too little memory is asked for, queries may spill to disk. Look, no one wants their queries spilling anywhere. Disk is dreadful. When a plan that requires a memory grant executes and is cached, actual memory needed to run the plan is recalculated, and the plan information is updated accordingly. Right now, it requires the presence of a ColumnStore index to achieve Batch execution mode. What If The Magic Isn't So Magical? This feature does have a terminating point in which it will fall back to the original memory grant. If queries run that need constant recalculating, our magical feature will give up. Eventually. As of this writing, I don't have all of the implementation details on when it will quit. You may also observe it during regular query tuning over multiple runs in the actual execution plan. Of course! Here's a stored procedure. Under the right circumstances, it will ask for an incorrect memory grant. The query plan has a warning on the select operator. Sadness indeed! Our query asked for too much memory. On second execution, the warning will disappear. Itzik Ben-Gan and Niko Neugebauer have both come up with workarounds to features and operators that require Batch Mode execution. Both methods are valid workaround to get this to work! WHERE ( Id = -2147483647 AND Id = 2147483647) -- eez impossible! Not the answer you're looking for? Browse other questions tagged sql-server sql-server-2017 memory-grant-feedback or ask your own question. SQL Server 2017: How do Batch Mode Adaptive Joins work? SQL Server 2017: How does Interleaved Execution work? What exactly can SQL Server 2014 execute in batch mode? How to make use of Batch Mode with an UNPIVOT (a loop join)? Why does CCI creation on an empty table request a huge memory grant? Why does batch mode window aggregate yield arithmetic overflow? 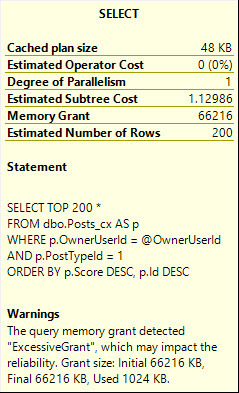 When does SQL Server warn about an Excessive Memory Grant?